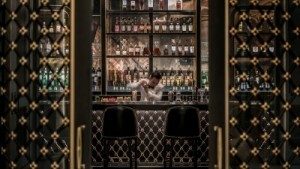 “Look for the lightbulb” is not the most helpful advice for finding this hidden bar that channels the gentlemen’s clubs of Victorian England, but it never stops the cocktail enthusiast from visiting the bar. Stockton is hidden off Wyndham Street – another best kept secret in Hong Kong. Since its opening back in November 2013, Stockton holds a special place in its patrons’ hearts as the go-to destination for an after-hours choice of award-winning cocktails. Head Mixologist Suraj Gurung, a passionate rum lover originating from Nepal, presents an unusual selections of cocktails that, in his own words, each tells a different story. “At Stockton, we tend to take classic recipes as a guide and put a unique twist to it. I especially enjoy making and seeing my team make our Negroni because we toss the drink instead of the classic way of stirring,” says Suraj. His cocktail series, Minds Undone, is a homage to great writers of our time, such as F. Scott Fitzgerald, Oscar Wilde and Ernest Hemingway and has brought Stockton many awards including #11 on Asia’s 50 Best Bars 2018. Suraj Gurung will be in town for one night only and take over Nautilus Bar at Four Seasons Hotel Jakarta to show off his skills to mixing his creative cocktails and tell the unique story behind every drink.